Once I fill a notebook, I file it away and seldom pick it up again. A few weeks ago, however, I needed some information that I knew was in a notebook from a few years ago, so I dug several of them out and began leafing through them looking for the notes that I wanted. As I read, I was profoundly struck by the sheer amount of personal history that I had forgotten. There were events that I did not remember attending, projects that had faded into memory, random observations that I would not have otherwise recalled, and acquaintances whose last names and faces had completely escaped me. It was not only the little, everyday memories that had slipped my mind; there were a few major ones as well. On page after page, I was reminded of who I used to be and what I used to do, and I was glad that I had written at least some of it down. I used to always advise people not to worry about trying to write in their journals every day. Notebook-keeping is not supposed to be a chore. It is not a homework assignment, and I have always felt that the fastest way to lose interest in personal writing and drawing is to turn it into just another item on a never-ending to-do list. 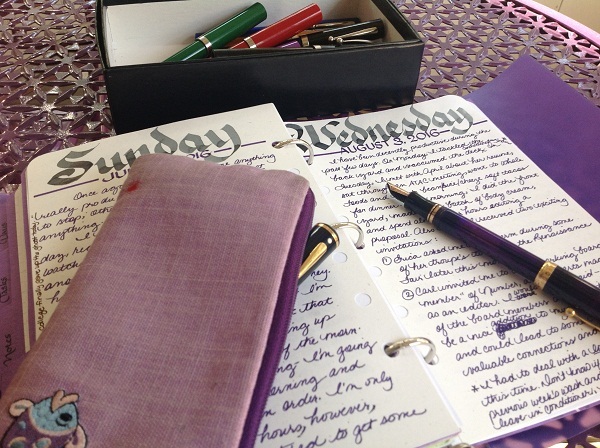 Sitting down with a well-worn notebook and favorite pen should be a pleasure enjoyed as often as desired, not a drudgery done as a daily obligation. Still, my recent browsing through my old books has made me reconsider my previous approach to keeping a journal. I have become more movitated to record something every day. Recording helps me to remember. I tend to live very much in each moment and have almost no sense of chronological time. Everything before Now is a vague jumble of recollections that I do not spend much time thinking about. Writing in my notebook helps to imprint Now in my mind and the notebook itself becomes a valuable reference tool. Recording helps me to recollect what I have accomplished. I habitually think of myself as someone who has not achieved very much in life. I compare myself to other people and, all too often, give myself an unfavorable score. When asked to list my accomplishments or even a simple, "What did you do today? ", I usually draw a blank. Yet, when I look back through old calendars, to-do lists, and notebooks, I surprise myself with all of the things that I have done: projects successfully completed, skills learned, goals met, and techniques mastered. I may not have found a cure for cancer or started a multi-billion dollar company before I reached the age of 30, but I have racked up a lot of quiet, personal successes that I can take pride in. Recording helps me to see how much I have changed as well as all the ways in which I have not changed a bit. Looking through those old notebooks, I found it amusing to compare and contrast my daily life as it was back then to what it is now, in every area from the amount of money in my savings account to the kinds of food I eat. I enjoyed seeing which interests and hobbies have continued and which got dropped or picked up along the way. My doodles and marginalia are more or less the same; my sketching and lettering have improved slightly. Without a regular notebook-keeping habit, I would probably not be able to identify the trends, themes, and changes in my life as easily. Recording helps me to understand who I am. When it comes right down to it, a life consists of hundreds, thousands, millions of actions and experiences. Each of us is a fascinating creature – a continuously changing compilation of everything that we have seen, done, encountered, and endured from the second we were born until the ever-shifting now. Having a visual and/or written record of that input can help us to know ourselves better, which is not only worthwhile in itself but is also a valuable tool for personal growth. Paying attention to and reflecting on what went into making us who we are now can help us shape our future selves – who we want to be. My writing and drawing habit goes back many years, and while I have recently come to appreciate how much I have recorded, I also now realize just how much I didn't capture. For all of the scribbled pages of minutiae, there are entire weeks full of quotidian adventures and even major happenings that went by without so much as a single word of note. Those moments and occasions have evaporated from my brain and so, for all intents and purposes, are completely lost to me. This is not an acute tragedy, but it is a bit distressing. I do not dwell in the past, but I do not want to miss it, either. And so, I am changing my previous advice: I resolve to record every day, and I think you should, too. I still firmly believe that journal-keeping should not be a burden. There are many times when I am too tired or too busy or just too lazy to write a full entry or do a detailed drawing. I do, however, want to make an effort to capture at least a few moments from every day. Whether it's setting a timer to do a quick sketch for five minutes before bedtime or jotting down random commentary here and there as time permits, I am determined to preserve a tiny slice of each and every day.